A full-time lawyer, Robert Whitley is also an avid prone, Highpower, and cross-course shooter. Over the past two years, Robert has pioneered a cartridge for these disciplines (as well as long-range varminting) based on the 6.5mm Grendel necked down to 6mm. Robert calls the cartridge the “6mmAR”. The 6mmAR cartridge has performed very well in AR-based comp guns, both with shorter bullets loaded to mag length, and 105-107gr bullets single-loaded. Robert has complete info about the 6mmAR on his website, 6mmAR.com, including recommended loads and field test results. Robert also builds and sells products for across-the-course shooters, including complete AR uppers, chambered in a variety of calibers, including 6mmAR. Jerry Tierney, 2005 NBRSA 1000-yard champion, has a 6mmAR upper built by Robert and Jerry says the upper “Absolutely shoots great. I love it.” In the past few months, Jerry has broken many NRA senior records with his new 6mmAR-chambered rifle. Share the post "6mmAR Case-Forming Video"
The NBRSA 600-Yard Nationals (Sloughhouse 600) will be held April 25 – 27, 2008 at the Sacramento Valley Shooting Center. This 3-day Match is hosted by the Folsom Shooting Club, at the Sacramento Valley Shooting Center in Sloughhouse, CA, a few minutes East of Sacramento. This event grows more popular every year as more and more top shooters are drawn to the relatively new 600-yard benchrest discipline. Last year, Don Nielson (shown in VIDEO below) dominated the field, shooting a 6.5×47 and a 6-6.5×47. Match fees are $60.00 per class (light gun and heavy gun), if you sign up today. Fees are $65.00 per class after March 31, 2008. If you have further questions, or need forms mailed to you, contact match Director Ed Eckhoff via email: eckran [at] yahoo.com. Share the post "NBRSA 600-Yard Nationals in Sacramento, April 25-27"
Our friend “DesertFrog” enjoys shooting “tactical/practical” rifle matches in Southern California. To maintain his skills, he tries to get quality “trigger time” every week. This helps him work on his body position, rifle handling, and breath control. Recently DesertFrog acquired a Savage Mark II-BTVS in 22 LR. These retail for about $330.00. The ergonomics of the Savage BTVS rifle were similar to his thumbhole-stock .308 tactical rifle. He decided that having a .22LR practice gun would allow him to maintain his monthly round count at a significantly reduced cost. Share the post "Rimfire Practice for Tactical Shooters"
Larry Crow of Competitive Edge Gunworks in Missouri has created a new, patented, full-floating action sleeve for benchrest and tactical rifles. This is an innovative, new design unlike previous action sleeves or barrel-block systems. 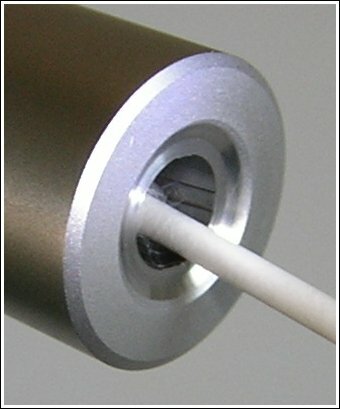 The barrel is attached conventionally to the receiver and does not touch the stock or sleeve. The sleeve wraps around the action and mates with the stock. This design allows the entire barreled action to float free above the stock. The system greatly simplifies stock inletting and bedding. Initial bench testing with a 6.5-284 Light Gun and a .338 Lapua tactical rifle have been extremely promising, showing that the new system is capable of exceptional accuracy. The 6.5-284, fitted with a Broughton 1:8″ twist barrel, produced multiple 5-shot groups, at 100 yards, under 0.20″ in size (Note: this is not a competition aggregate; some groups were larger, but the typical group, in good conditions, was well under 1/4 MOA.). That is remarkable for a fast-twist barrel shooting long, boat-tail bullets. At longer ranges, the 6.5-284 displayed extremely low vertical spreads. A 12-twist .308 Win rifle fitted with the floating action sleeve was recently tested by U.S. Army shooters using factory ammo. Larry Crow reports that his Army testers said the gun “was the most accurate rifle they’ve ever tested using factory loads”. The Army also tested a .338 Lapua with the sleeve system, and it shot a 4″ group at 1000 yards. Larry also notes that a respected 1000-yard shooter is building a rifle with the new action-mounting system to use in IBS registered competition this season. It will be interesting to see how it performs against more conventional designs. For more information, contact Larry Crow at Competitive Edge Gunworks, (660) 731-5124. Share the post "Patented Floating Action Sleeve Delivers Outstanding Accuracy"
The Savage Mark I-FVT single-shot .22 Caliber rimfire smallbore target rifle can now be purchased by CMP-affiliated clubs, youth camps, 4-H Shooting Sports clubs, and Boy Scout (BSA) organizations for $212.00 each through a special marketing agreement between Savage and the CMP. The $212.00 price includes sights and shipping. Measuring 39.5″ overall and weighing just 5.25 lbs., the rifle is a comfortable fit for juniors. It features an adjustable Williams rear match sight and front globe sight with multiple apertures. The Mark I-FVT rifle comes with the adjustable Savage AccuTrigger®. Any CMP-affiliated organization with a junior shooting program may apply to the CMP for a purchase eligibility certificate. To purchase these rifles, organizations must first submit a purchase eligibility certificate application. CLICK HERE to download application form. If you have questions, contact CMP Program Sales: (419) 635-2141 ext. 1115; email clubrifle [at] odcmp.com. Share the post "Savage .22 LR Youth Match Rifle for $212.00"
The SPOT Satellite Messenger is a unique safety product that can benefit hunters and anyone who ventures a long way from “civilization.” These days, many of us carry cellphones. These come in very handy if you have a vehicle break-down or sustain an injury close to a population center. However, your cell phone won’t do you much good when you’re way out in the boonies. Consider this… over 50% of the U.S.A. does NOT have cell-phone coverage. SPOT has no such limitations. In fact, SPOT works around the world, even on the oceans. The SPOT device is new and there’s nothing else really like it on the market. With the touch of a button, it can send a distress signal to authorities. The message will include your true position within a few feet, based on GPS coordinates. SPOT sends your GPS coordinates to a GEOS Emergency Response Center every 5 minutes, allowing you to keep moving if necessary. Emergency responders are then updated with your last known location. Unlike a traditional GPS device which only receives a satellite signal indicating your location, SPOT utilizes dual satellite networks to receive your location as well as transmit it along with pre-programmed messages to the recipients of your choice. Backed by one of the world’s leading mobile satellite companies, the SPOT satellite network is currently employed by over 50,000 governmental and industrial clients, and averages a greater than 99% message success rate. If you have a problem but do NOT want to call the authorities (yet), SPOT offers an “Ask for Help” function that transmits your help request and position to your friends and family. A “Check-In” function lets contacts know where you are and that you’re okay. We think that’s a great feature for anyone who regularly travels in the backcountry. Apparently Cabela’s Customers agreed… the SPOT earned a Gold Medal in Cabela’s Annual Buyers’ Choice Awards. The SPOT unit typically retails for $129.99 to $150.00 ($169.99 MSRP). In addition, to use the service, you must pay a subscription fee of $99 per year or $9.99 per month. The Progress Tracking feature costs an extra $49.99 per year. Share the post "SPOT Emergency Messenger Employs Satellite Technology"
Sanetti will be leaving Sturm, Ruger and Company after 28 years of service. Sanetti was hired by Bill Ruger in 1980 to be Ruger’s first general counsel and rose through the executive ranks to become President and Chief Operating Officer and Vice Chairman of the Board of Directors. Sanetti has been a member of the NSSF Board of Governors and the Sporting Arms and Ammunition Manufacturers’ Institute (SAAMI) Board of Directors. A founding member of the Firearms Litigation Support Committee, Sanetti helped direct the successful response to municipal lawsuits that threatened the firearms industry in the late 1990s. AccurateShooter.com is pleased that Sanetti is an active target shooter with an interest in rifle competition. Sanetti was a three-year member of his college rifle team and later the team’s coach. He captained Ruger shooting teams at industry competitions. Sanetti says his favorite hobby is target shooting with his family. A 1971 graduate of the Virginia Military Institute, Sanetti earned his law degree from Washington & Lee University Law School. He served as a captain in the U.S. Army from 1975-1978. Share the post "Sanetti Leaves Ruger, Takes Helm at NSSF"
This deal is set to expire soon, so don’t hesitate if you’re looking for a very heavy front rest at a bargain price. Now through March 31, 2008, MidwayUSA has knocked $30.00 off its 1000-yard competition “Rock” front rest (item 627414), so it’s priced at just $129.99. Offer expires 3/31/08. This is the extra-heavy 24-lb. version with an 18″ footprint. It is designed for big 1000-yard guns and comes with a 5″-wide three-lobe front bag. The rest top, however, will accept other bags from Caldwell or other suppliers. Note that Caldwell BR rests adjust windage by rotation of the rest top rather than linear tracking. Still, we’ve used these 24-lb rests and they are solid and functional, though many owners eventually upgrade the rather thin 3-lobe front sandbag. Purchaser Richard S. from Colorado reports: “The rest is heavy and very solid. This is a great rest for the money. I replaced the Caldwell bag with a leather Protektor bag. The rest has groves made to accommodate the Protektor bag and it is a perfect fit.” Butch Lambert of ShadeTree Engineering can also adapt his joystick rest top to these units. Share the post "Heavy Caldwell BR Rest now $129.99"
This week, American Rifleman Television continues its coverage of John Moses Browning, America’s prolific gun designer. You will not want to miss “The Greatest—John M. Browning, Part II,” which focuses on John Browning’s legendary military arms designs — from the ’97 trench gun, to the timeless m1911, and light and heavy machine guns. When you consider that Browning designs are still being used both in combat (.50 BMG machine gun) and competition (1911 pistol), a century after their inventions, it’s clear that Browning was nothing short of a genius as a firearms designer. Part of the Outdoor Channel’s “Wednesday Night On The Range” lineup, American Rifleman Television airs each Wednesday at 10 p.m. Eastern Standard Time, (7 p.m. Pacific). The show repeats on various days and times throughout the week. For a complete listing, or to find out how you can receive Outdoor Channel, go to OutdoorChannel.com. Share the post "J.M. Browning Story this Week on TV"
Larry Willis is the inventor of the unique Innovative Technologies Belted Magnum Collet Resizing Die. Larry explains how this die works, and offers many other useful reloading tips on his website, LarryWillis.com. Share the post "Inspection Method for Your Barrel Crown"
The Hickory Shoot, the nation’s most popular groundhog shooting competition, is slated for April 5th this year. Now in its 28th year, this is the biggest Varmint competition on the East Coast, with over $4000.00 worth of prizes awarded each year, including $1000.00 in cash. Compete individually or as part of three-man teams. The entry fee is $25 per person, plus (optional) $10 extra per team. The match will be held in Vale, North Carolina. For MapQuest or Google maps, use this address: 8216 Will Hudson Road, Lawndale, NC 28090. This year, there will be three targets, set at 100, 300 and 500 yards. (No unknown distance). In the past, 6BRs, 6BR Improveds and the mid-size 6mms have been the calibers to beat. To see what it takes to win, read this article about Harold Seagroves’ Spencer-built 6BR, which has won the Hickory Shoot multiple times. The range will be open Monday-Friday preceding the match for practice. The match will start 8 o’clock sharp Saturday morning the 5th. If you have any questions call Larry Willis, Bulls Eye Sporting Goods, (704) 462-1948. This year the targets will be at known distances, 100, 300, and 500 yards. That should be a cake walk for you 1000-yard shooters. Share the post "Hickory Ground Hog Shoot — April 5"
Dave Emary, Chief Ballistic Scientist at Hornady Mfg., was named one of the “Outdoor Life 25″ by Outdoor Life magazine. This annual award honors leaders, innovators, and conservationists who have impacted the outdoor sports in a positive and significant way. Emary was one of the principal designers for the AMAX™ and FTX™ bullets, the 17 Mach 2 and 17 HMR rimfire ammunition, the popular .204 Ruger cartridge, as well as the new 6.5 Creedmoor cartridge. Emary holds Bachelors of Science degrees in Physics and Aeronautical/Astronautical Engineering from Bowling Green State Univ., and the Air Force Institute of Technology. He served in the U.S. Air Force from 1981 to 1987, achieving the rank of Captain, with service at the Ballistic Missile Office of Norton AFB, and the Pentagon. As a civilian he developed and tested ballistics at the Los Alamos Laboratory (NM), and the Olin Corporation (FL). Share the post "Hornady's Dave Emary Honored"
Grafs.com is offering “blow-out pricing” on the 13th Edition of the Speer Reloading Manual. Regularly priced at $20.99, the Speer Manual (item PS9510) is now just $9.99. This hefty 730-page hardcover resource offers more than 8,000 load recipes with powder charges and bullet data. The Speer Manual also includes detailed ballistics tables, bullet energy and velocity tables, plus sections on special techniques, problem-solving and more. The 13th Edition of this popular reloading guide was updated with an improved format for quick reference. Note, however, the 13th Edition was first published in 1998. The latest edition of this manual is the 1149-page 14th Edition, published in 2007. The 14th edition has more technical tables and over 9,000 load recipes. The 14th Edition (shown below) is available from Grafs.com for $29.99 (item SP9515, in stock now), or from MidSouth Shooters Supply for $27.50 (item 021-9515, on order). Share the post "13th Speer Reloading Manual Just $9.99"
The full line of K&M reloading tools and accessories is now offered by PrecisionReloading.com. The popular K&M Arbor press (with optional seating force measurement gauge) is in stock. The K&M arbor costs $78.00, or $115.00 with the force measurement system. This clever design uses a Bellville washer stack and linkage to show the force required to seat your bullet on a standard dial indicator mounted on the top (dial is $22 extra.) In addition, Precision Reloading offers K&M neck-turning tools, primer seaters, expanders, neck reamers, and flash-hole uniformers. Based in Mitchell, South Dakota, Precision Reloading is run by active, knowledgeable shooters. In addition to centerfire reloading supplies and tools, Precision Reloading offers a full line of shotshell components and shotgun reloading equipment, plus optics, cleaning supplies, gun cases, and hunting gear. Share the post "K&M Products at Precision Reloading"
On March 28-30, Cabela’s is running a major gun sale at many of its stores. This “Gun Show” weekend will feature great discounts on both new and used firearms. Customers are also invited to bring in their own firearms to sell, trade, or consign. Cabela’s has collected inventories from its gun vaults, placing hundreds of used guns on sale for the first time. In addition, participating stores will offer new guns at special savings. The Cabela’s “Gun Show” will be held at these participating stores: Boise, Buda, Dundee, East Grand Forks, Fort Worth, Glendale, Hamburg, Kansas City, Kearney, La Vista, Lehi, Mitchell, Prairie du Chien, Owatonna, Richfield, Rogers, Sidney, and Wheeling. In addition, gun safes will be offered at low, discounted prices at the following locations: Boise, Glendale, Kansas City, Lehi, Owatonna, Richfield, and Rogers. If you live near any of these locations, this is an excellent opportunity to acquire a quality gun safe at significant savings. Share the post "Cabela's "Gun Show" Sale Weekend, March 28-30"